Well, that is what I think about brakes. If you have a car with a powerful engine which could run fast as a cheetah but doesn’t have enough powerful brakes to stop it OR control it, you better sell it ASAP 😛 . So today in here, we’ll see what are brakes & the types of brakes ! Brakes are mechanical devices which absorb the kinetic energy of the system & convert it into any other form of energy(generally heat) in order to stop a moving system. They are not only used to stop a moving system but also to prevent motion of any part of a particular system. We generally see them mounted on the end of the shafts & axles of vehicles. In this type, a block OR a shoe is attached to a lever & is pressed against a rotating drum(wheel). One end of the lever is pivoted at a point(on the chassis somewhere) & force(P) is applied on the other end. Human applies force(F) via pedals but is not enough to produce the braking torque. 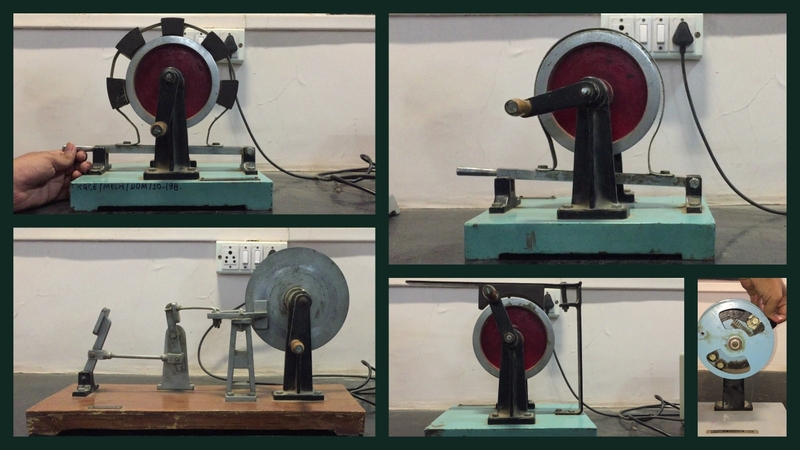 Here comes the lever; the lever multiplies the force(F) by some constant(C) to produce greater force(P) to generate enough pressure between drum & shoe ! More the lever distance, less the human effort ! This is important while designing ergonomics of the vehicle ! The constant C depends on the length of lever, distance between contact point of shoe and drum & pivot point. In the animation, my hand applies force(F) & the force which get applies on the drum is much greater force(P) ! Another version of these brakes contain 2 shoes on the opposite side to increase the braking torque. Such types are called Pivoted type double shoe brake. They are widely used in trains even now. Look around the wheels next time while you travel; they’re fairly easy to notice ! A band brake, as seen in our animation basically contains a lever & a band which gets rubbed against the drum(wheel). One end of the lever is attached to a fix point also called as pivot point & force is applied to the other end. The band consists of a flexible leather belt OR steel lined with with friction material. The band surrounds the drum with some clearance. As soon as the pedal is pressed, the band gets rubbed against the drum which eventually comes to rest. Disc brakes are the most widely used brakes & can be seen in almost every application such as bicycles, bikes, cars etc. Here in disc brakes, 2 pads possessing high friction are used instead of shoes. These pads are arranged such that the the disc is exactly mounted between the two brake pads. The brake pads are connected & operated with the help of multiple levers, jaws & spring. We could see in the animation that when we press the brake pedal, the motion is transmitted via levers & the brake pads apply pressure on the disc from both the sides. The braking force then tries to retard the motion of disc thereby bringing the vehicle to a halt. In cars, the brake pads are usually mounted in the calipers wherein they’re pushed with the help of hydraulics. Brake fluids are used to push the pads towards the disc. An animation of the same is covered below in hydraulic braking. The working of band & block brake is pretty much similar to band brakes except that they contain blocks between the band & drum. The blocks maybe wooden or any other friction lined material. More the number of blocks, more is the braking force & thus higher retardation. These types of brakes were widely used in trains. Here, the friction lined shoes are placed inside the rotating drum. Both diametrically opposite shoes are C-shaped. One end of both the shoes are fixed on a point i.e their fulcrum(lower side in our animation). While the other end is connected to cam operated lever & a retractable spring(upper side of drum in animation). In our animation, when we rotate the cam the brake shoes get expanded in radially outward direction thus applying pressure on the inner surface of drum. A force called as braking force gets applied due to this applied pressure & the drum’s motion is brought to rest. When we release the cam, the spring having the tendency to contract, pulls the shoes towards itself allowing the drum to rotate again. Hydraulic brakes are basically a system where brake fluids are used to operate braking mechanism i.e to generate pressure on brake pads & thus to push them towards drum or discs. The brake fluids are generally contain glycol ethers or diethylene glycol. As you can see, the brake fluid is placed in a master cylinder(reservoir); when you press the pedal, first some extra fluid enters into fluid lines through inlet port. When you further push it, pressure is generated into tubes & in calipers. This pressure forces the pads to get close to the disc. Alternately, in a drum type brake the brake fluid is pushed into a wheel cylinder which pushes shoes instead of pads. The reason why a combination of disc brakes & hydraulic braking systems are used because they have good efficiency as well as high heat dissipation rate. You might like – Why are brake lights red ? Electromagnetic brakes slows the speed of an object through electromagnetic induction which creates resistance & converts the motion into electrical or heat energy. Such systems in which the converted energy is immediately used for other purpose or stored for later, are called as Regenerative braking systems. An example of electromagnetic braking systems are the Eddy current brakes used in some trains. When permanent magnets are brought near the rotating wheels, eddy currents are produced thus resisting its own motion according to Lenz’s law. Higher the magnetic induction, greater the resistance & thus higher resistances are able to stop the train. Electromagnetic brakes are also used in roller coasters.